Tesco is to fit more than 2,400 charging bays at some 600 stores over the next three years – said to mark the UK’s largest free charging network while increasing the number of public charging bays in the UK by some 14%. The supermarket giant, also said to be the UK’s largest fuel retailer, has teamed up with Volkswagen and Pod Point for the initiative, which will offer customers free charging using a standard 7wK fast charger or access to a 50kW rapid charger “for a small cost in line with the market rate”. The charging bays will be installed by Pod Point and will be offered in Tesco Extra and Superstore car parks throughout the UK. The move means tens of thousands of motorists will be able to charge their electric vehicles each day while carrying out their shop at the supermarket, bringing convenience of charging and also helping to reduce range anxiety. The RAC also said it would encourage diesel and petrol drivers to make the switch to EVs. RAC spokesperson Rod Dennis commented: “Strong and easy-to-use charging infrastructure, alongside the development of battery technology and lower upfront costs, is vital in accelerating the take-up of electric vehicles. 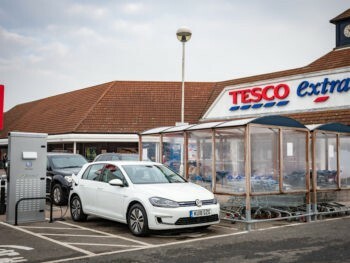 For Tesco, the programme is intended to ensure it becomes the leading EV energy provider and forms part of its wider commitment to addressing environmental issues. Volkswagen added that the initiative underlines its commitment to becoming a leading player in e-mobility and deliver on its pledge to sell one million electric cars a year worldwide by 2025. 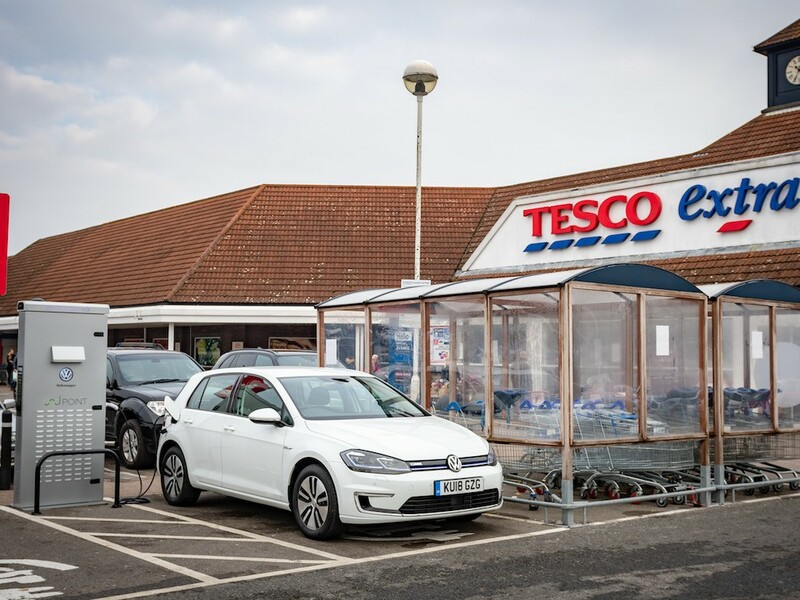 Geraldine Ingham, head of marketing at Volkswagen UK, commented: “This incredibly exciting partnership with Tesco, powered by Pod Point, underlines the scale and ambition of our electric car programme in the UK.